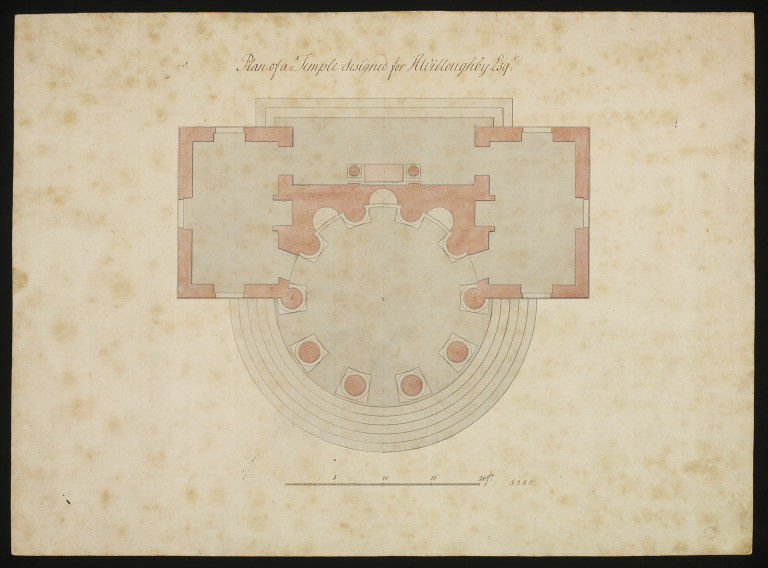 Plan of the temple for Henry Willoughby, before 1759 by leading architect and designer Sir William Chambers (1723-1796). 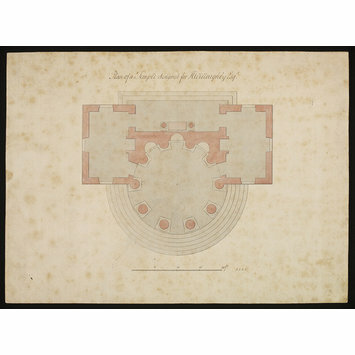 Ground plan of a circular temple, two flanking rooms and the linking screen. When Chambers published his Treatise in 1759 he included several projects in the hope of further patronage, and this temple is one of these as there is no evidence that the temple was built. Willoughby was listed as one of the original subscribers to the first edition of the Treatise. The building consists of a single-storey structure of two rooms with an open area between, into which a domed circular Doric temple has been incorporated, which originated in Italy (see cats.746-750.) The two rooms are accessible through the domed circle of columns or from the other side, where the plan shows a block or plinth flanked by columns (no doubt for an aedicule) in the manner of a classical altar. The columns are attached to the wall linking the two buildings are cornice level before rising free to support the dome. Plan of the temple for Henry Willoughby, before 1759. Ground plan of a circular temple, two flanking rooms and the linking screen. The building consists of a single-storey structure of two rooms with an open area between, into which a domed circular Doric temple has been incorporated, which originated in Italy (see cats.746-750.) The two rooms are accessible through the domed circle of columns or from the other side, where the plan shows a block or plinth flanked by columns (no doubt for an aedicule) in the manner of a classical altar. The columns are attached to the wall linking the two buildings are cornice level before rising free to support the dome. When Chambers published his Treatise in 1759 he included several projects in the hope of further patronage, and this temple is one of these as there is no evidence that the temple was built. Willoughby was listed as one of the original subscribers to the first edition of the Treatise. Ground floor plan of the temple for Henry Willoughby, before 1759, Sir William Chambers (1723-1796). Attribution note: Scale: 1 1/8 in to 10ft.